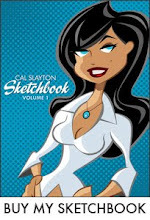 cal slayton | illustrator | graphic designer | comic book artist | dallas | dfw: Dallas Comic Con! 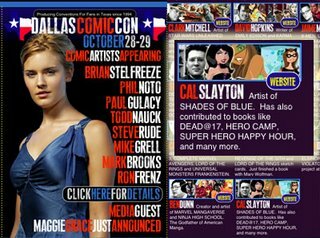 Once agian the great guys at the Dallas Comic Con have invited me to be a guest at their show. It's on Saturday, October 28th from 11:00 to 6:00 and Sunday, october 29th from Noon to 5:00 at Plano Centre in Plano on Springcreek. Looks like it's gonna a big show. Maggie Grace - Shannon from the #1 television series LOST. Also appeared as Elizabeth from the horror film THE FOG. Appearing Saturday only! Ron Glass - Shepherd from the television series FIREFLY and SERENITY (2005), and much more. Appearing courtesy Las Vegas Autographs Saturday and Sunday! Jake Lloyd - Anakin Skywalker in STAR WARS EPISODE I: THE PHANTOM MENACE. Also featured in recurring roles on THE PRETENDER and ER. Voice of Anakin in STAR WARS video games. Kelly Stables - Evil Samara from THE RING 1,2,and 3. Appearing Saturday only courtesy Las Vegas Autographs. Daniel Logan - Young Boba Fett in STAR WARS EPISODE II: ATTACK OF THE CLONES. Also appeared as Zaylan on HERCULES: THE LEGENDARY JOURNEYS. Steve Rude - Creator and artist of NEXUS. Mike Grell - Known for his art on GREEN ARROW and WARLORD. Brian Stelfreeze - Cover artist for SHADOW OF THE BAT. Todd Nauck - Creator and artist of WILDGUARD. Paul Gulacy - Artist of CATWOMAN, JSA CLASSIFIED. Phil Noto - Artist of DANGER GIRL: VIVA LAS DANGER. Scott Kurtz - Creator and artist of PvP. Brian Denham - Artist of DARKNESS, KILLBOX, ELSINORE. Cat Staggs - Airbrush artist for STARWARS.com. Tom Hodges - Artist of the STARWARS webstrips. David Hopkins -Writer of EMILY EDISON. Ben Dunn - Creator and artist of NINJA HIGH SCHOOL. In your opinion, what's the best time to come out? Saturday for sure. Some guests aren't there on Sunday. Maybe after 12:00 would be good, there might be a big crowd right at the beginning of the show.